It's official! The Dodge Caliber is dead, and it's successor will be called...the Dart! Dodge has already revealed 4 teaser images of the exterior, and will reveal some interior images on the 13th. The car is scheduled to debut on January 9th, at the 2012 North American International Auto Show. I just added the 2001 Dodge Powerbox (or PowerBox?) concept. Being a concept, it has only one engine, which I added. Gamer wrote I just added the 2001 Dodge Powerbox (or PowerBox?) concept. Being a concept, it has only one engine, which I added. And the croatia rally in ERC?? The Croatia Rally was supposed to be before Geko Belgium Rally, but it was changed to 26/27 September. I did not add this championship, who added was DeltaGolf. Rinspeed wrote source for 2002 spain? This season of Spain Rally Asphalt, Jesús Púras (224) won eight and last title ahead of Santiago Concepción (150) and Sergio Vallejo (146). The top 10 was closed by Enrique García Ojeda (74 points), then the most closer of top 10 was Joan Vinyes (71 points). I accidentally putted the Javier Azcona with 75 points but he didn't obtain. I just had a thought. Shouldn't we have a Dodge (Mexico) page? They've had a bunch of models that were only sold as Dodges in Mexico (final generation Ramcharger, the various rebadged Hyundais, plus the latest Dodge Attitude (a rebadged Mitsubishi Mirage G4/Attrage) and Dodge Vision (a rebadged Fiat Grand Siena), just to name a few). Also, since there is a Ram Trucks page, there's also the Ram 700, a rebadged Fiat Strada, also exclusive to Mexico. carcrasher88 wrote I just had a thought. Shouldn't we have a Dodge (Mexico) page? I agree, but there are no Mexican Dodges on the website yet, so I don't see the need to add it. Yeah. If I had the proper information for them, I'd do it myself. carcrasher88 wrote Yeah. If I had the proper information for them, I'd do it myself. Same problem for me. I think I could get info on new Dodges from the official site, but info on older Mexican Dodges is impossible to find. JFK wrote Is this welcome? 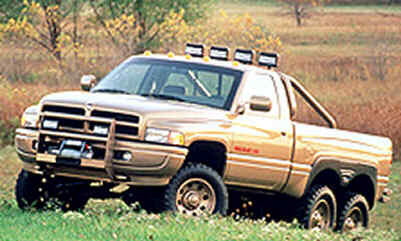 Six wheeled Dodge T-Rex, prototype based on 1997 Dodge Ram Regular Cab. If it's a prototype, go right ahead.